In this July 17, 2018, file photo, Malaysian King Sultan Muhammad V salutes during the national anthem at the opening of the 14th parliament session at the Parliament house in Kuala Lumpur, Malaysia. Sultan Muhammad V abdicated unexpectedly after just two years on the throne. 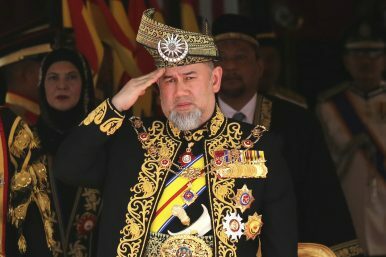 Malaysia’s royal families will meet on January 24 to pick a new king after Sultan Muhammad V abdicated unexpectedly after just two years on the throne, an official said Monday. Keeper of the Ruler’s Seal, Syed Danial Syed Ahmad, said the Council of Rulers held a meeting Monday and set January 24 to elect a new king. He said in a statement that the new king would be sworn in on January 31. During his first stint as prime minister for 22 years until his retirement in 2003, Mahathir pushed through constitutional amendments that stripped the sultans’ power to veto state and federal legislation, and curbed their legal immunity. The monarch’s role is largely ceremonial, since administrative power is vested in the prime minister and parliament. But the monarch is highly regarded, particularly among the ethnic Malay Muslim majority, as the supreme upholder of Islam and Malay tradition. Reports in Russian and British media and on social media featured photos of his wedding with a former Miss Moscow that reportedly took place in Moscow. Neither the sultan, the palace, nor the government had officially confirmed the wedding. Next in line for the top job is Sultan Azlan Shah of central Pahang state, who was king from 1979 to 1984, but the 88-year-old is now unwell and didn’t attend Monday’s council meeting. Some observers said he can abdicate in favor of his son, who can become king. After Pahang is the billionaire Sultan Ibrahim Ismail of southern Johor state, who is involved in business, owns a fleet of jets, and loves Harley-Davidson motorcycles.